Biophysicists from MIPT have studied the structure of a nanofibrous scaffold, as well as its interaction with rat cardiac cells. The study, which is part of the research into heart tissue regeneration, revealed that cardiomyocytes — heart muscle cells — envelop nanofibers as they grow, while fibroblasts — connective tissue cells — tend to spread out on fibers forming several focal adhesion sites. The study was conducted at MIPT's Laboratory of Biophysics of Excitable Systems in collaboration with the researchers from the Shumakov Federal Research Center of Transplantology and Artificial Organs and the Institute of Theoretical and Experimental Biophysics of the Russian Academy of Sciences. The article was published in the journal Acta Biomaterialia. "Using three independent methods, we discovered that during their development on a nanofibrous scaffold, cardiomyocytes wrap the fibers on all sides creating a 'sheath' structure in the majority of cases," explains Professor Konstantin Agladze, head of the Laboratory of Biophysics of Excitable Systems. "Fibroblasts, by contrast, have a more rigid structure and a much smaller area of interaction with the substrate, touching it only on one side." Regenerative medicine seeks to repair or replace lost or damaged human cells, tissues, and organs. Tissue engineering is often the only way to restore the functions of the human heart and achieve recovery. Creating "patches" for a damaged heart demands more than merely understanding the properties of the corresponding tissue cells: One also needs to study their interaction with the substrate, as well as with the surrounding solution and the neighboring cells. Vital for the growth, development, and formation of regenerating tissues is the substrate on which cells are grown. The scaffolds used for cardiac tissue engineering are based on a matrix of polymer nanofibers. Nanofibers may vary in terms of elasticity and electrical conductivity, or they may have additional "smart" functions allowing them to release biologically active molecules at a certain stage. Nanofibers are designed to mimic the extracellular matrix, which surrounds the cells, providing structural support. In addition, nanofibers can be used as a medium for delivering substances into the surrounding cells in order to induce biochemical changes in them. So studying the interactions between the scaffold and heart cells is essential for choosing the right nanofiber features — i.e., those that would bring an artificial structure closer to that in a living organism. The team conducted a three-stage study to determine the structural features of cardiac cells as well as the nature of their interaction with the fibers. First, the researchers studied the structure of cardiomyocytes and fibroblasts grown on a substrate of nanofibers using confocal laser scanning microscopy: The tiniest sections of the cell were illuminated and scanned point-by-point allowing for the reconstruction of 3-D structures in the micrometric range. The structure of cardiomyocytes and fibroblasts (the nucleus and the components of the eukaryotic cytoskeleton) as well as that of the fiber was pre-stained with fluorescent antibodies. The obtained 3-D images showed that both types of the studied cells were aligned along the fibers and had spindlelike shapes (fig. 1). However, this data was insufficient to study the cell-fiber interface. Cell samples were then sectioned into ultrathin slices in a plane perpendicular to the direction of the fibers and "photographed" using transmission electron microscopy (TEM). In the course of the study, a beam of electrons was transmitted through the sections. A detector was placed behind the sections to detect those electrons that passed through. Their number does not merely depend on the thickness of the sample: It is also indicative of the properties of the material. Various cell structures absorb electrons that travel through the specimen differently. The researchers discovered that cardiomyocytes envelop nanofibers on all sides so that the fiber ends up being in the middle of the cell. Nevertheless, it remains separated from the cytoplasm by the cell membrane (fig. 2). Fibroblasts do not "swallow" the fiber, they only touch it on one side. Moreover, TEM images demonstrate that the nucleus of the fibroblast is relatively rigid compared to other cell components. 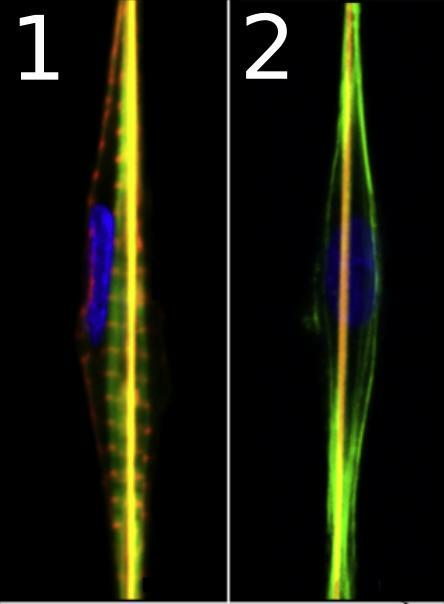 This makes fibroblasts less flexible, reducing their ability to stretch along the fiber (fig. 3). TEM made it possible to study the cross sections. Then, using scanning probe nanotomography, a comprehensive 3-D model was created. The researchers took cells grown on a substrate of nanofibers and sliced them into 120-nanometer-thick sections. Their surface structure was studied with a silicon probe and reconstructed in 3-D (fig. 4). The researchers observed some important aspects of the cell-fiber interaction. First of all, since stronger mechanical adhesion — i.e., cell-scaffold attachment — means cells are more stable growing on the substrate, cardiomyocytes will be firmly attached to the scaffold, while fibroblasts will be less stable. Secondly, additional "smart" scaffold functions, such as the release of growth factors — protein molecules that stimulate cellular growth — will also differ depending on the cell type. In the case of cardiomyocytes, which tend to envelop the nanofiber, the released substances will diffuse directly from the fiber through the cell membrane and into the cytoplasm. In the case of fibroblasts, on the other hand, a certain amount of these substances will leak out. Thirdly, cardiomyocytes isolate the polymer fibers from the surrounding solution. Since cardiomyocytes are responsible for the transfer of electromagnetic waves within the heart — and therefore for heart contractions — immersing the fibers of the scaffold completely in cardiomyocytes will enable researchers to test the electrical conductivity of the cells. This study, as well as further investigation into the mechanisms of cell-substrate interactions, will enable the creation of nanofibers that would provide cells with the properties needed to form regenerative tissues. This study was supported by a grant from the Ministry of Education and Science of the Russian Federation (Grant 6.9906.2017/BCh).